As babies begin the solid food journey, Gerber cereals with DHA are a great way to continue providing this important omega 3 fatty acid. DHA, naturally found in breast milk and many infant formulas, helps support brain and eye development. 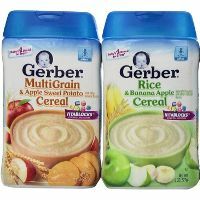 Gerber Cereals with DHA are made with natural grains, contain 18 milligram of DHA per serving and have all the great nutrition of other Gerber cereals.